The preservation of western cultural and the American Cowboy. Sharing the history of the early trail drives, the Chuck Wagon and those who pioneered untamed land. The content is for educational and entertainment purposes. 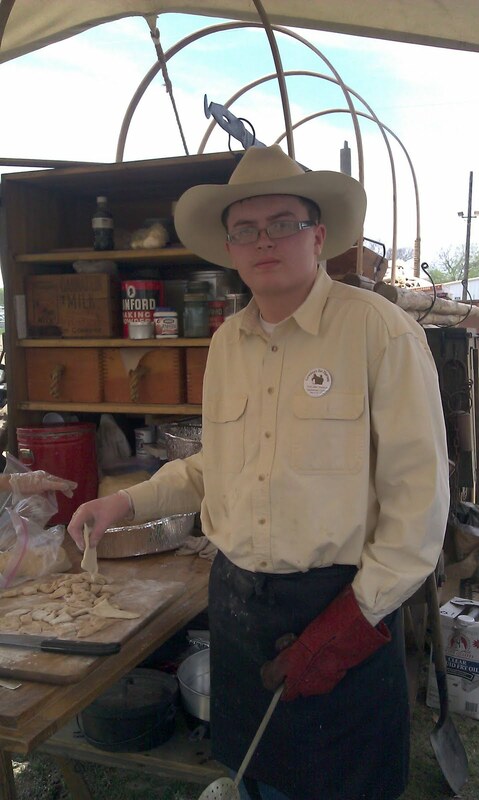 Cowboys and Chuck Wagon Cooking reviews cooking techniques, products and western gear which today is part of western life style. We hope you will enjoy your visit and look forward to comments, recipes and shared heritage. Thank you for your visit. Hope you follow us along the trail of news, stories and the Cowboy way. United States Copyright 2009 - 2018 under title 17 of the U.S. Copyright Code. The Spirit of the West gathering in Ellensburg, Washington has brought the best traditional cowboy musicians, poets, and artists together to celebrate the western tradition of ranching and the cowboy life. Past nationally known entertainers — many of whom have performed at Carnegie Hall, Grand Old Opry, National Public Radio and numerous other venues around the world included - Don Edwards, Waddie Mitchell, Baxter Black, R. W. Hampton, Wylie and the Wild West, Stephanie Davis Band, Paul Zarzyski, Sourdough Slim, Doris and Belinda and Juni Fisher. 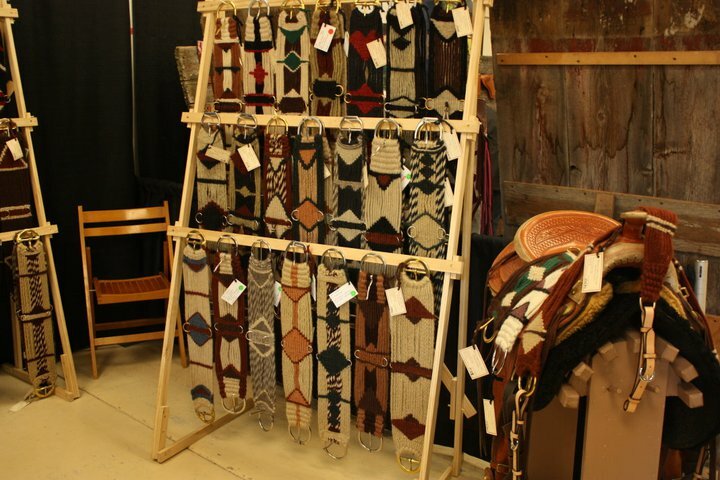 The entertainment goes beyond the extravaganza of music, including cowboy poetry and western art, Ranch Roping Competition, Chuckwagon Cook-off, Square Dance lessons, Gun Show, a Fiddle contest, the kids corral, Whiskey tasting, Blacksmith and spinning needlework demonstrations. This is one of the greatest Cowboy events in the Pacific Northwest receiving a good turn out from the event evident by the crammed parking lot of the Rodeo Fairgrounds. 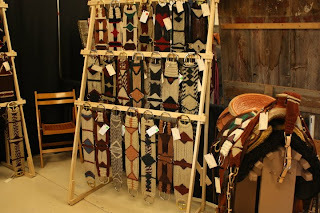 Cowboy-Western Art, Photography and Poetry projects decorated the wall of the Spirit of the West - Dance Hall. Buckaroos from around Kittitas County elementary schools used this year’s theme "Be Kind to Animals" using the Code of the West, “8 Principles to Live By” to create their projects. Several hundred projects were on this years display. “Trail Boss” Bill Holmes devoted many hours planning and rounding up the needed sponsors as Ellensburg hosted their first competitive Chuckwagon Cook-off. Bob Ottmar is the President of the recently formed Northwest Chapter to the American Chuck Wagon Association. The ACWA organization founded in Bryson, Texas, 1997 today has members in 31 states, Canada, Germany, Sweden and Switzerland. 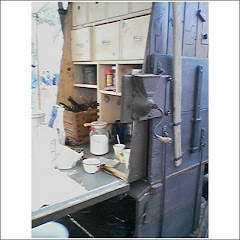 The interest of chuck wagon cooking has since grown founding the Northwest Chapter in July of 2010 that includes Washington, Oregon, Idaho, Montana, British Columbia and Alberta, Canada. 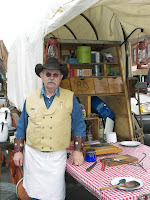 Bob Ottmar has demonstrated Chuck wagon cooking at the Spirit of the West event in previous years with the Columbia Basin Dutch Oven Society. Bob has been cooking with cast iron Dutch Ovens for about 12 years. During the 2010 gathering, Bob spoke with Keith McGowan about putting the competitive event together inviting other chuck wagon enthusiast to participate. Each wagon team prepares meals for up to 50 people. Many travel concerns about rain and snow eased with the provided sunny days though the temperatures still cold dropping each night below freezing. 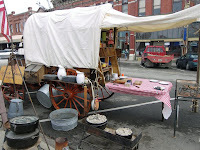 However, as the weekend remained clear, the Chuck Wagon Cooks managed their wagons as they set up along the downtown streets of Ellensburg. 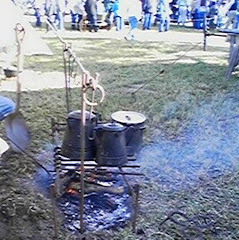 Cooking during these events normally are done over open fires and dug out ground pits but the spit irons had to be ran over fire-boxes and Kingsford BBQ coals provided by sponsors due to City Ordinance and Fire Marshall. The crowds of visiting tourist among local folks filtered through the serving lines for the hearty meals. Each wagon team made staples of Cowboy Chicken fried Steak, Chuck wagon Beans, Potatoes, Breads and Biscuits and Peach Cobbler feeding 50 meals per wagon. 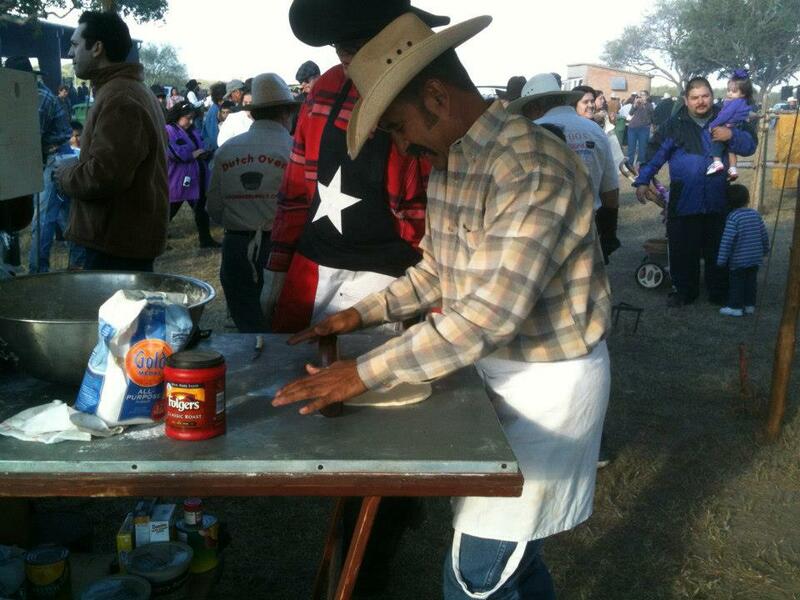 Each team with hopes to become the Grand Champion of the Spirit of the West Chuck Wagon cook-off. Friday, February 18, 2011 Wagon judging for the best and most authentic looking wagon set up went to Greg Akehurst of Longhorn Cattle Company. Overall Winner and Grand Champion went to Greg Akehurst, Longhorn Cattle Company . Bob Ottmar built his wagon using the running gear from a wagon that came across the United States from the mid west following the Oregon trail. He located the wagon in Oregon where the previous owner share the story about his great grand father's passage. Restoring the running gear, Bob elected to rebuilding the wagon box, provide with new bows, canvas and chuck box. Bob researched dozens of photos to finished his wagon. To learn more about judging Chuck Wagons, Bob visited The Spirit of the West Festival held in Sioux Falls, South Dakota last September meeting with cook-off host Cassandra Swanson and Bob Sparks and Bill Thompson from the American Chuck Wagon Association. Bill Thompson and Bob Sparks were on hand to not only be wagon and event judges during the Spirit of the West Festival held in Sioux Falls but also conduct a Wagon Judging Clinic training others from across the nation. After attending this event, Bob brought back his knowledge of lessons he learned to conduct the Ellensburg event plus help establish the new Northwest Chapter. "We have over 12 wagons in our area" states Bob. The northwest chapter after approved by the American Chuck Wagon Association then elected officers from their newly formed membership of their new committee: Bob Ottmar - President, Rod McGuire - Vice President, John Spain - Secretary, Greg Akehurst - Treasures and Les Meyers - Director. The group now has 9 members. The Northwest Chapter of American Chuck Wagon Association has confirmed three events for the 2011 season with additional inquiries from others areas in Washington, Oregon, Idaho and Montana. 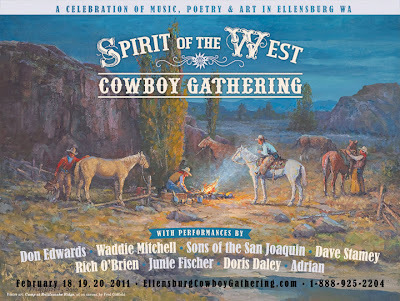 Completing the Spirit of the West, Ellensburg, Wa this past February with current schedule events planned for Stevensville, Montana June 18-19, 2011 and Dayton, Washington (Mule Mania) July 15-17, 2011. The Chuck Wagon Cook - Off sponsors contributed to the successful competition at the Spirit of the West and the Ellensburg community. Juni Fisher was one of many performers during the Spirit of the West. She tours the country delighting audiences with her original songs, exquisite vocals and outstanding guitar playing. She has an uncanny ability to bring alive unforgettable characters and images, stunning stories that often carry a deep and compassionate reflection of the human spirit. 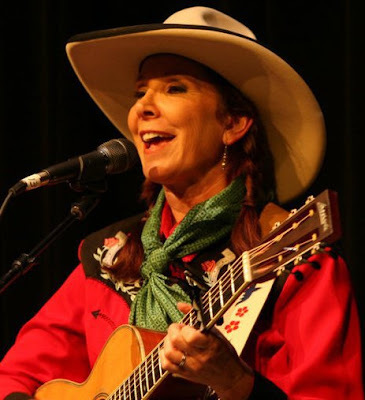 Her 2009 Wrangler Award from the National Cowboy and Western Heritage Museum is a landmark win, the first woman to win a Wrangler Award in the Outstanding Western Album category. Juni has won Western Music Association awards every year from 2005 to present, most recently in 2009 for Album of the Year and Female Performer of the Year. Labels: acwa, American Cowboy, camp cooking, chuck wagon, chuck wagon cooking, chuckwagon, ellensberg, wa. 2012 Best Food BLOGGER nominee, Cowboys and Chuckwagon Cooking was ranked in the top Ten precent out of 150 web sites for 2011. We want thank our readers and hope to receive your vote again this year. United States Copyright 2018 under title 17 of the U.S. Copyright Code: . Travel theme. Theme images by andynwt. Powered by Blogger.